We're always on the look out for fun and exciting routes to add to our extensive database and this month we've teamed up with Wild Swimming to offer a series of new routes on your device or via My.ViewRanger all in time for the Bank Holiday weekend. 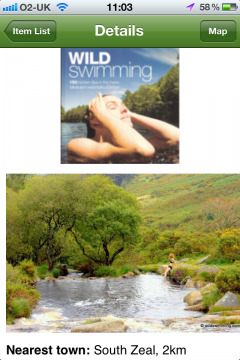 Wild Swimming is a celebration of wilderness dipping, natural bathing and riverside picnics. It's a truly unique British travel guide covering six regions; South-West, South-East, Wales, Central East, Lakes & Dales, and Scotland and the North, working with the author, we've picked out the most remote places, where having the route on ViewRanger will really help you. With ViewRanger's comprehensive feature set you can record your destination, get on-screen navigation guidance and you can even mark your start point (where you've parked your car), on maps, so you can find your way back easily as well. We'd recommend that before heading out, that you install detailed GB OS Explorer or Landranger maps for the regions required for these routes. You can get these from our Webshop, or using in-app purchasing (find out more). Once installed this mapping works off-line, without a mobile signal.